My name is Matt Winick from Ann Arbor, Michigan with a strong interest in learning history and social justice. In these subjects, I like to learn the need for Civil Rights to be stronger to reduce discrimination, protect the environment from pollution, and many others. 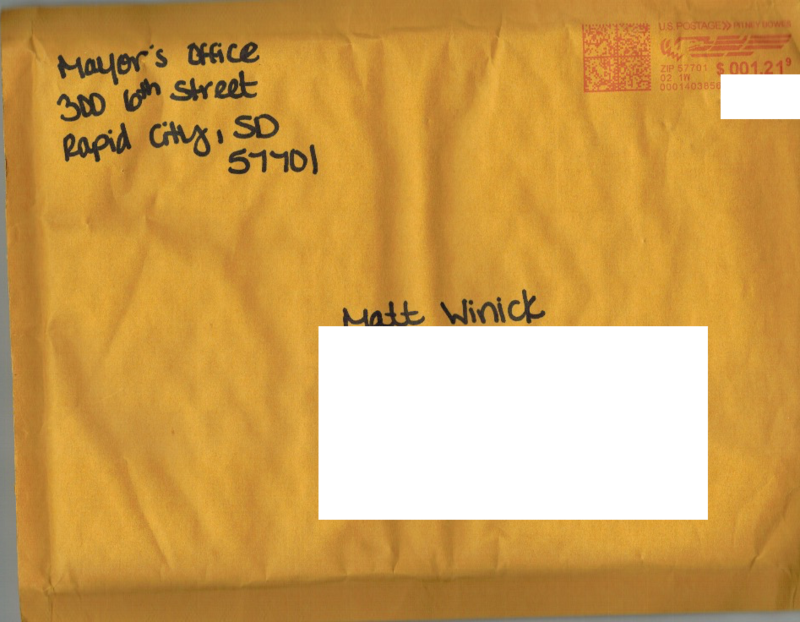 Mayor Allender, the main reason I’m writing you a letter is to explain how I find your work as Mayor of Rapid City, South Dakota to be very inspiring to me. 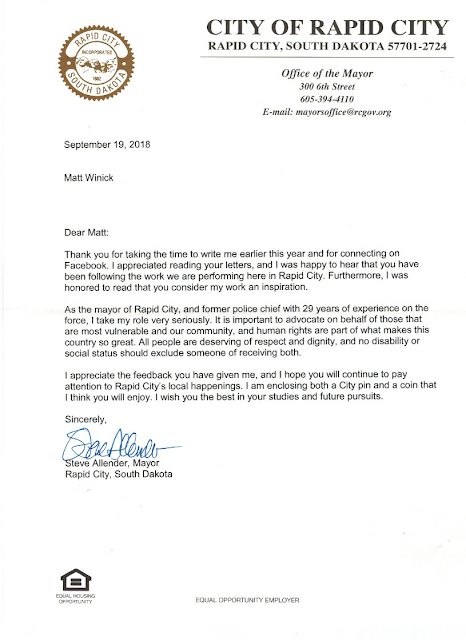 In your current role as Mayor of Rapid City, South Dakota, I’m very proud on how you are a strong supporter of Civil Rights by advocating for people with disabilities’ rights, supporting funds to help women including minorities businesses to help them compete in the economy, and advocating for the need to strengthen Civil Rights to help protect minorities including people who are different from being discriminated. On the economy, l liked on how you expand on job-training programs to help train youth including workers to develop work-skills to help them prepare for the economy and provide tax credit to small businesses to help them hire people like minorities, women, and people with disabilities to work for them. Funding special education to help students with disabilities get the educational accommodations they need to learn, expanding on after school programs to provide youth with help on their assignments from tutors, and push for funds for arts including diversity programs to help make education diverse to learn is common sense for education reform. I like your approach on protecting the environment like funding renewable energy resources to reduce addiction to oil with gas, working to improve city services to help clean parks including water resources to make them safe for people to use, and pushing for more environmental educational awareness programs to help teach people about the need to protect the environment. Another thing that I like about your work as Mayor of Rapid City, South Dakota is how you push for funds to help restore historical sites, museums including attractions to improve tourism while make learning a better place, implement job shadowing program in city services to help train new hires to explore different department in city services to understand how it works, and working to push for more affordable housing to help people who can’t afford to live get shelter. 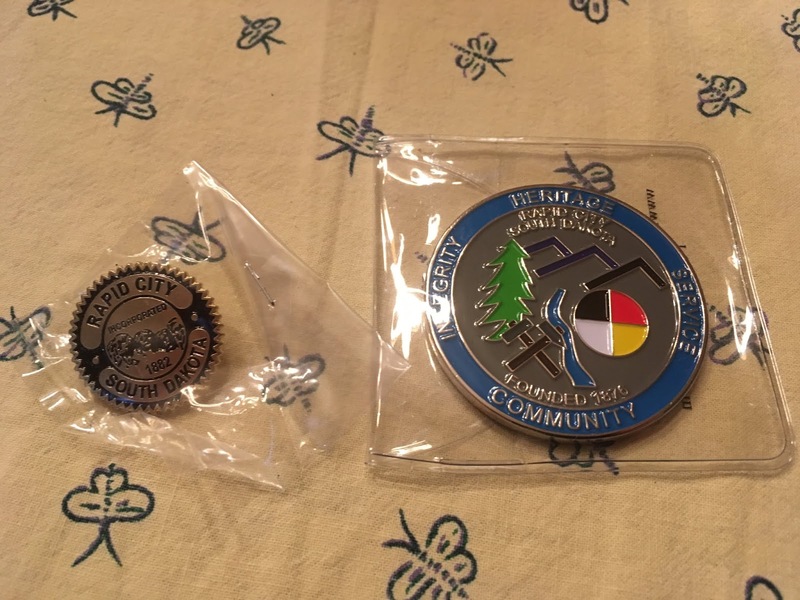 Mayor Allender, I have autism with a learning disability. Having a disability is hard for me because I have trouble comprehending on learning different advance subjects, sometimes I struggle to communicate my thoughts, and get teased. Your commitment to be a strong supporter of Civil Rights including people with disabilities’ rights really inspires me to work hard on my disability. Also your role as Mayor of Rapid City, South Dakota gives me motivation to continue to learn history and social justice. My future goal is to someday work in these areas to help emphasize the need to make Civil Rights stronger to reduce discrimination, protect the environment from pollution, and improve social justice to make communities safe. 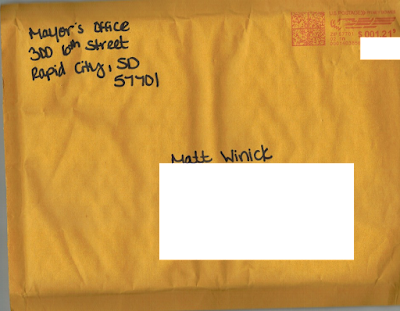 I strongly believe that you are making a great difference in your current role as Mayor of Rapid City, South Dakota. I’m proud how you are working hard to improve Civil Rights, protect the environment, and fix city services to make them be helpful to citizens. You have inspire me to work hard on my disability and to continue to learn different subjects like history and social justice. Thanks for taking the time to read my letter, working hard to make a great difference, and inspiring me. I wish you the best to continue to make a great difference.